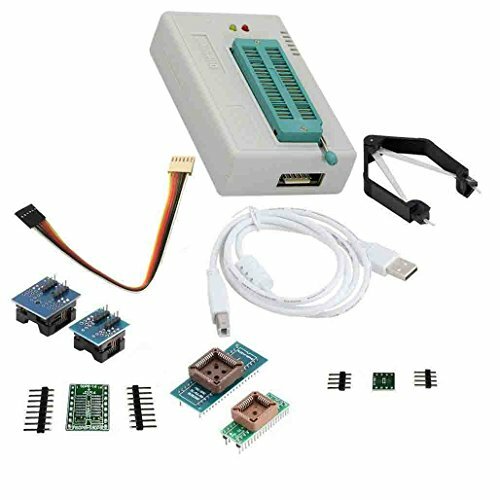 Tl866II PLUS programmer is the improvement of TL866CS/A programmer, difference is much higher programming speed (up to 2x) of high-capacity memories. It supports multiprogramming mode (up to four ). Well-designed cheap professional programmer, Production of high-density SMD technology, a unified user interface, easy to use, fully functional, reliable program running of application software, ultr-small code -runs faster, supports bilingual (English and Chinese), it can automatically identify the operating system to install and run under WIN 2000/WIN XP/WIN 2003/WIN 2008/WIN VISTA /WIN7/WIN8/WIN10 (32BIit/64Bit). View More In Logic Products. If you have any questions about this product by Laqiya, contact us by completing and submitting the form below. If you are looking for a specif part number, please include it with your message.